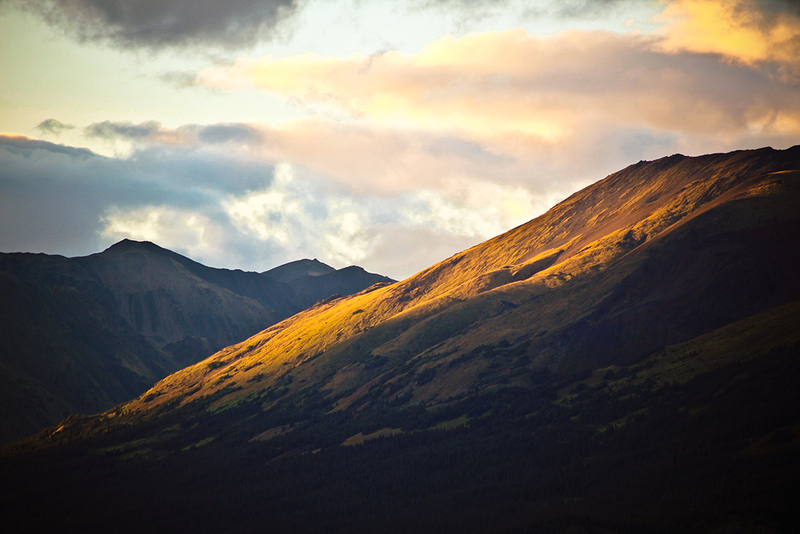 The Sacred Headwaters, Northern British Columbia. Desiree Wallace photo. Beyond Boarding is a grassroots collective aimed at combining snowboarding with environmental and social activism. Our projects, films, actions and events are used as platforms to give space, and to promote and prioritize the voices of those most affected. That being said, Beyond Boarding cannot speak for the Tl’abonatine, yet we can speak of our collective’s solidarity work in the territory and our experiences up there. As a snowboarder, it is not typical to spend the summer months occupying drill platforms or blockading roads. Most riders work summer jobs to fuel winters of snow-filled pleasure, but last summer, Beyond Boarding headed to Northwestern BC to join a resistance led by the Klabona Keepers, a group of indigenous Tl’abonatine elders and grandmothers fighting to protect their traditional lands from industrial exploitation. As snowboarders, we find that most of us are directly affected by climate change and are rarely engaged in the bigger picture — climate change is about more than melting glaciers or too-warm, winter rainstorms on the ski hill. Climate change, and the heavy industry contributing to it, also creates social and global injustices that disproportionately affect low-income, indigenous and marginalized communities around the globe. This story is our perspective on an environmental and social justice movement happening in Tl’abane, BC’s Sacred Headwaters. It’s a story about what happened when a couple of snowboarders spent a summer helping to protect unceded native lands from a 269-acre, open pit mine. It’s a story that has not yet found an ending, and a struggle that continues today. Over 250,000 square kilometres in size, the Sacred Headwaters is an extraordinary region of unceded land and water in the Pacific Northwest corner of BC. Traditionally known as Tl’abane, it’s a vast wilderness area where grizzlies, caribou, moose and wolves still outnumber people and North America’s most vital salmon–bearing rivers — the Stikine, the Skeena, and the Nass—are all born in close proximity. 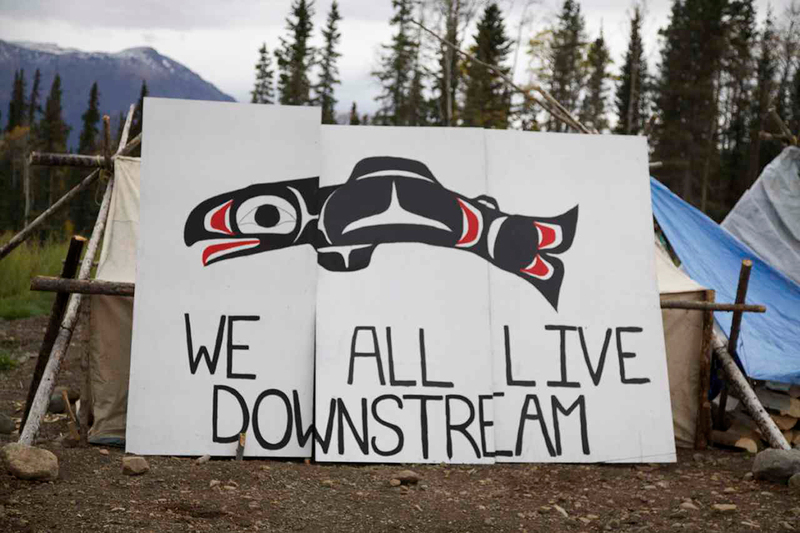 The Headwaters is also where one of BC’s biggest environmental victories took place, where a small group of Tl’abanotine elders and their families, acting under the Western name Klabona Keepers, drew a line in the sand and said no. In 2004, ten Klabona Keeper elders and their families prevented Royal Dutch Shell from fracking more than 1,000 coalbed methane gas wells within the Sacred Headwaters. As snowboarders, we find that most of us are directly affected by climate change and are rarely engaged in the bigger picture — climate change is about more than melting glaciers or too-warm, winter rainstorms on the ski hill. Environmental victories of this magnitude are rarely accomplished by such a small group, but the Klabona Keepers’ battle is far from over as large-scale, destructive industrial projects continue to put Tl’abanotine waters, traditional land, animals and communities’ wellbeing at risk. Currently, there are over 100 companies jostling for tenures and permits in the Sacred Headwaters and the BC Provincial Government seems hell-bent on pushing mining development into the area as quickly as possible and without proper consultation or consent from the local community. One of the first projects hoping to take advantage of the recently completed 287 kV Northwest Transmission Line (see sidebar) is Imperial Metal’s Red Chris mine on Togadin Mountain. Historically, Iskut received its electricity from large diesel generators; however the recently finished construction of the 287kV Northwest Transmission Line (NTL) by the province of BC has changed that. The price tag for that project set BC taxpayers back just under a billion dollars and was sold to them as a “green project” to get Iksut, a community of 300 people, off of diesel-generated power. An alarming $130 million from the Canadian government’s Green Infrastructure Fund went towards the 344-kilometre line. In actuality, NTL is a massive subsidy to big industry, opening the region up to large-scale mining and providing power for new proposed mines. How convenient that the provincial and federal governments can use Canadian taxpayers’ Green Infrastructure Fund to assist the indigenous peoples, while ironically paving the way for big industry to destroy their traditional hunting grounds and unceded territory. It became clear during our time on blockades in the Sacred Headwaters that the government openly and aggressively promotes lucrative development deals and creates incentives for development, none more prominent of an example than this transmission line. As a result of everything, for the last decade there has been a rapid surge in large-scale mining projects sought out by an international mining industry made rich by continued lawless, colonial plunder. “Todagin Mountain is our table and our food and we don’t want to see it go,” said Rita Louie, Klabona Keeper elder. Rita and other elders explained to us that traditional hunting grounds and camps on Todagin Mountain, long considered the breadbasket of the nation, have been decimated by the open pit coal copper and coal mines. Additionally, Imperial Metal’s tailing pond dam — proposed to be filled with heavy metals such as arsenic, lead and mercury — sits above the Little Klappan River, which directly flows into the Stikine River, one of the three prominent salmon bearing watersheds of the Sacred Headwatersand an integral food source. Red Chris mine has a tentative opening date of 2015, but the Klabona Keepers have opposed the project since the early 2000s. In 2005, a group of elders were arrested while trying to stop the mine, but despite the resistance, Imperial Metal’s proposal was fast-tracked through the environmental assessment process and subsequently became one of the first mines in Canada given permits to build a tailings pond on a fish-bearing lake. 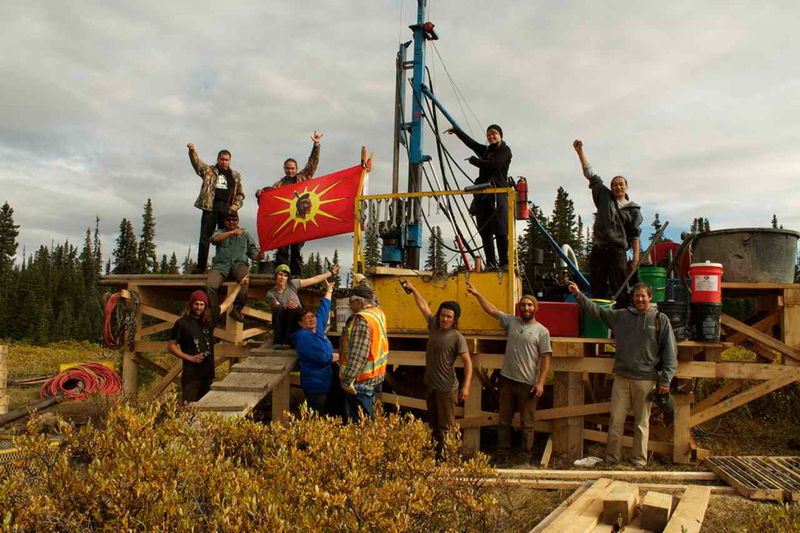 Klabona Keeper elders had already set up a blockade to protest this project when we arrived in August 2014. Several Beyond Boarding members joined the blockade. Some had ridden bicycles over 2000 kilometres from Vancouver to the Sacred Headwaters to raise funds, awareness and share the story of the Klabona Keepers. The blockade was put up shortly after Imperial Metals’ other major mine, Mount Polley in the Cariboo region of BC, unleashed 10 billion litres of toxic wastewater into the Quesnel River when a tailing pond breached on the fourth of August, 2014. The Mount Polley disaster released lead, arsenic, mercury, cadmium and selenium, all heavy metals that accumulate up the food chain, into a river that ultimately ran into the Fraser River, potentially affecting thousands of people downstream (and many of the province’s key spawning salmon runs) and into Quesnel Lake, the deepest glacier-fed lake in BC. At one point, it seemed like progress was being made. The Keepers removed their blockade after being promised an independent review of the Red Chris mine project as well as an opportunity for Klabona elders to visit the Mount Polley disaster site, presumably to witness clean-up efforts in real time. As weeks passed however, Imperial Metals continued to work on developing the Red Chris site and didn’t follow through on either of their promises. Then, a group of Secwepemec women from the Mount Polley area visited the Sacred Headwaters and shared first-hand accounts of what was happening down south, in their territory. They told stories of how the mine manager had ignored five warnings from the ministry of environment about the possibility of a tailings pond accident and how the Secwepemec community was now without fresh drinking water or fish to store for winter. After learning that the profits from Red Chris would likely help fund two more Imperial Metals mines in Clayoquot Sound, the Klabona elders immediately launched another blockade. And we were right beside them, even calling more friends from the snowboarding community to lend a hand setting up camp, protest signs and a roadblock. Boris, our veggie-oil school bus from an earlier Beyond Boarding adventure, made a particularly effective roadblock. The atmosphere was intense; with Red Chris very close to production, the elders confronted the mine manager, lit a sacred fire and occupied the camp/roadblock for several weeks. New friendships were made on the blockade as we turned trucks away daily. We were reminded over and over, “We cannot be blinded by money. The land and water are the lifeblood of our nation and we will not compromise them. We are doing this for future generations,” said Mary Quock, Klabona Keeper elder. It was easy to see the passion and dedication on everyone’s faces. 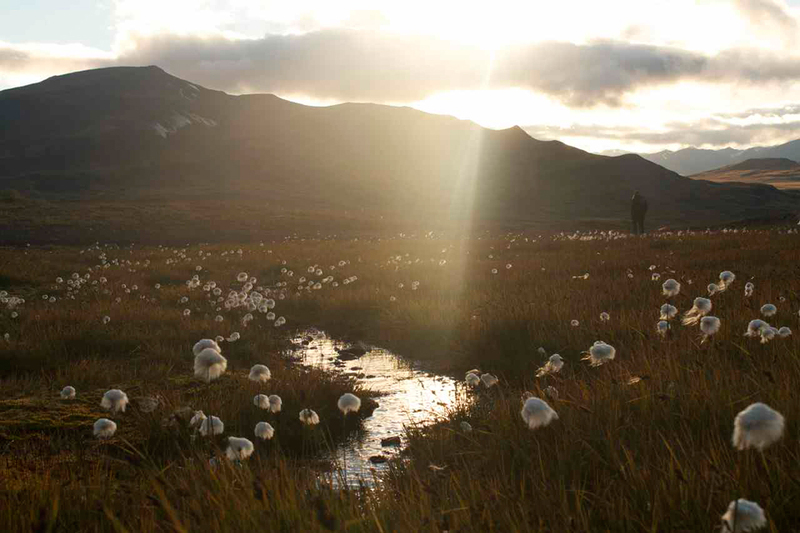 One of the local activists, a hunter named Ło’ok, hiked up Todagin Mountain —site of the future mine – and took a stone sheep with his bow. Most of the meat was given to the elders, a tradition in their culture, but we all shared in meals around the fire. 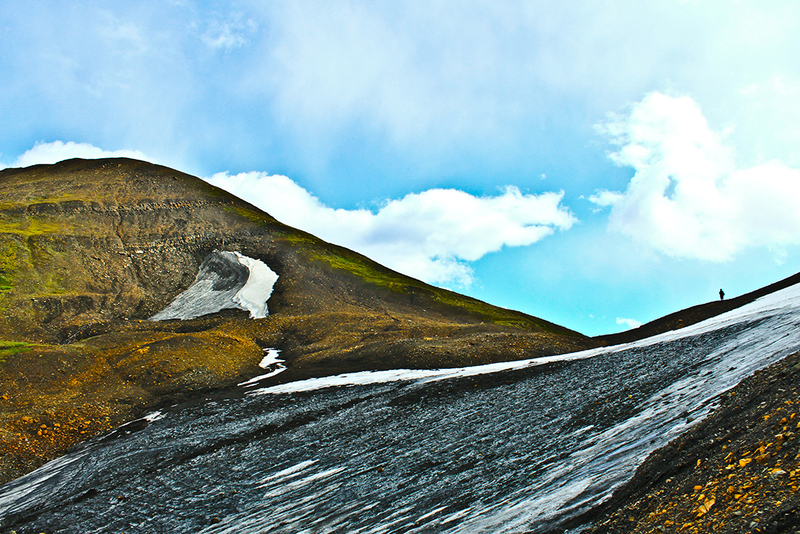 Todagin Mountain has the largest population of stone sheep in the world and eating that meat on the blockade made us wonder how 30 years of short-term mining revenue is considered more important than a mountain that can, and has, provided food for thousands of years. LEFT: A common sight in the Headwaters – a drill platform built on a pristine river. RIGHT: Klabona Keepers and their flag during the platform takeover. 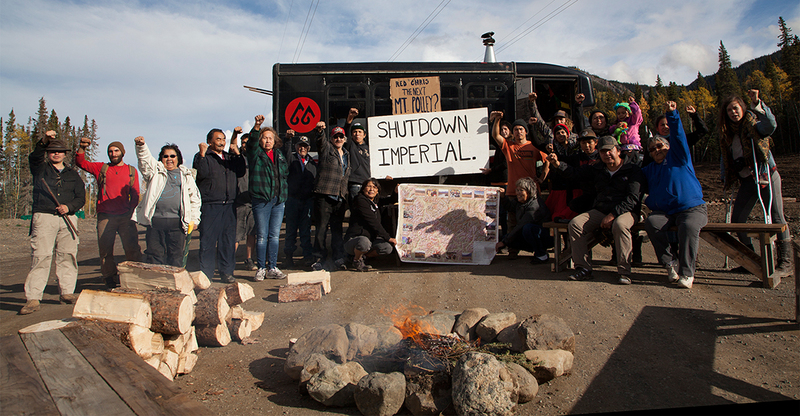 Two weeks into the new blockade, Imperial Metals filed for an injunction, a court-granted, colonial tool long used to dispossess indigenous peoples of their lands. Beyond Boarding was one group of many to face a similar injunction a month later on Burnaby Mountain, but unlike Kinder Morgan in Burnaby, Imperial Metals was allowed an interlocutory injunction to remove the Klabona Keepers off their road indefinitely. The blatant prioritizing of economic loss to the company, above the inherent rights and title to land of the elders, the community, and the environment, was tragic. For thousands of years on these very territories, these natural laws and customs have put a healthy environment above all. These laws respect the original inhabitants of the lands, predate company permits and rights, and have allowed indigenous people to live off these lands in the Northwest for millennia. They are laws passed down through the generations. They are laws that have created the sense of responsibility that the Klabona Keepers have to protect the way of life in Tl’abane. Robert’s words made us look past the tactics of activism and our desire to create change in the world. We need to find a fundamentally different way of being human, to rediscover the reality that human beings are not innately destructive, but rather meant to contribute to something much bigger than us. Like the elder explained at the start, we are the river, the air, the earth. Without them, we will not survive. The Tlabonatine’s fight will not be won overnight, nor will it be won without settler society and those in the cities putting pressure where these mining companies and legislatures are based. There is room for everyone in the fight for the sacred.